It is estimated that there are at least 1,900 carp in the water and that 45% of these are in excess of 20lbs. Of these we have identified at least forty different fish over 30lb, at least eight of these have now gone over 40lb. Good numbers of large perch and pike are also known to be present along with a few tench, bream and some very large roach. With a big 32 acres of water to fish this long, open, reed fringed lake has become very popular as a day ticket water and like all our other waters there is no limit to the time an angler can stay. We now believe that the water holds at least 50 different mirrors in excess of thirty pounds. The biggest of these has been caught at over 44lb and is the lake record. Weights on the water continue to rise and multiple catches are commonplace. We at Linear are confident that the water, under our careful management, will become even more popular in the future. The large head of carp this water contains continues to produce some stunning results with at least 45% of its estimated 1,900 stock believed to weigh in excess of twenty pounds and a majority of the remainder now being upper doubles, Brasenose One continues to provide great sport for the visiting angler. As with the other ticket waters the stocking policy on the Brasenose One Lake is on-going and more carp are being raised to go into this water in the near future. 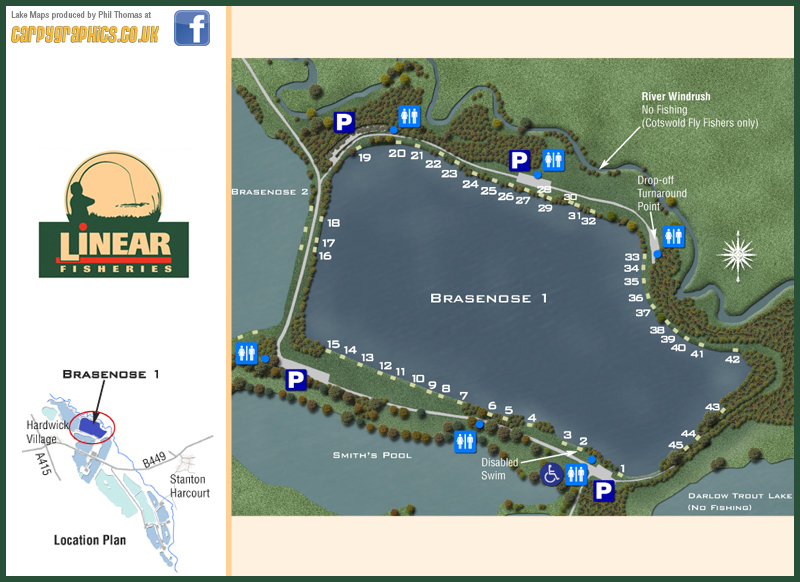 There are tracks around most of the lake and parking in many places is within easy walking distance of most swims. Please remember that the gates will be locked between 9pm and 8am (March-Sept) and between 6pm and 8am (Oct-Feb). If you arrive during these lock up times you must wait with your car in the early arrival car park by Hardwick Lake.